Four awesome bros in Germany were just minding their business and cruising in their custom BMW convertible with a pool inside this week when the traffic police pulled them over. More like the FUN POLICE, amirite? Bros? 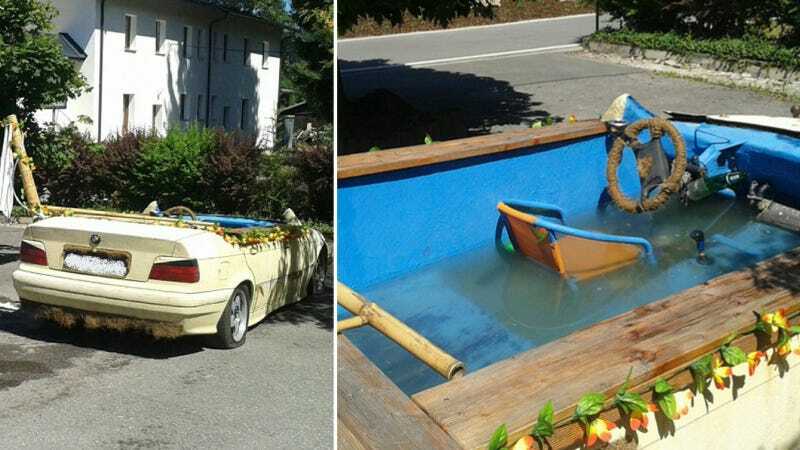 It seems that the owners of this zany summer funmobile decided to fill it with more than 500 gallons of water so they could keep cool while driving around their town of Eibenstock. "Hey fraulein," they must have hollered at the ladies. "Wanna go for a schwim in mein BMW?" The newspaper says the occupants fled on foot, but one later returned to collect the car, though he refused to admit he was the driver. They gave him his shoes and wallet back, but an investigation into possible drunk driving and driving without insurance is underway. Can't a man and his buddies cruise around in a BMW filled with pool water? On a side note, that water looks nasty.